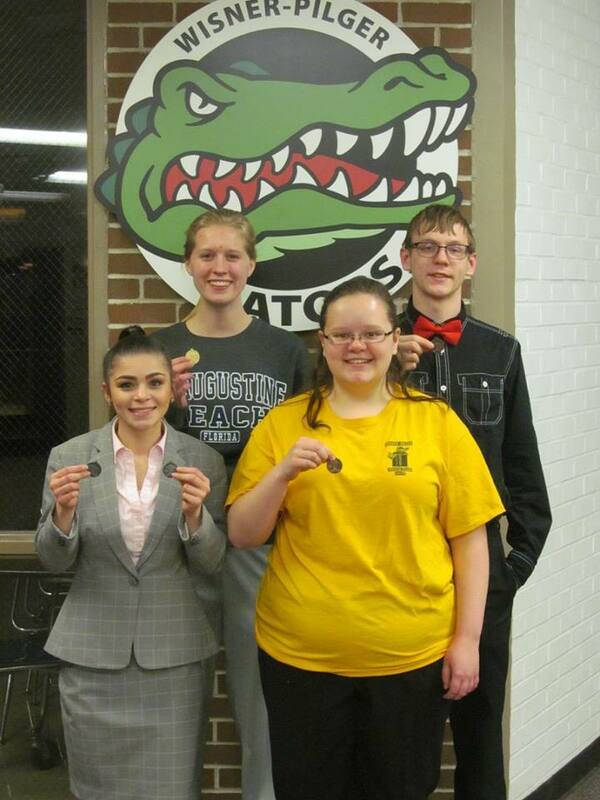 Four Wisner-Pilger Gator speech team competitors advanced to next week's state C1 championships at the C1-3 district contest held Wednesday at Hartington Cedar Catholic. Becca Thompson led the Gator efforts with a district championship effort in persuasive speaking, while Veronica Peck claimed two state tournament bids with runner-up silver medals in poetry and informative speaking. Brett Andersen calimed third place in entertainment speaking, while Grace Steinmeyer also advances to state with a third place finish in extemporaneous speaking. For Thompson and Steinmeyer, this will be their first trip to state, while this will be Peck's third straight year qualifying, and Andersen went to state two years ago. Just missing finals was James Kinnison in humorous prose, and drama team of Becca Thompson, Claire Raabe and Megan Schroeder. As a team, the Gators finished third overall out of the nine schools competing. The four Gator speakers will compete Thursday, March 22nd at the University of Nebraska-Kearney.